WikiLeaks founder Julian Assange repeatedly violated his asylum conditions and tried to use the Ecuadorian embassy in London as a centre for spying, Ecuador's President Lenin Moreno told Britain's 'Guardian' newspaper. London police dragged Mr Assange out of the embassy on Thursday after his seven-year asylum was revoked, paving the way for his extradition to the United States for one of the biggest ever leaks of classified information. Mr Assange's relationship with his hosts collapsed after Ecuador accused him of leaking information about Mr Moreno's personal life. Mr Moreno denied to the 'Guardian' that he had acted as a reprisal for the way in which documents about his family had been leaked. He said he regretted that Mr Assange had used the embassy to interfere in other country's democracies. "Any attempt to destabilise is a reprehensible act for Ecuador, because we are a sovereign nation and respectful of the politics of each country," Mr Moreno told the 'Guardian' by email. "We cannot allow our house, the house that opened its doors, to become a centre for spying," the 'Guardian' quoted Mr Moreno as saying. "This activity violates asylum conditions. Our decision is not arbitrary but is based on international law." 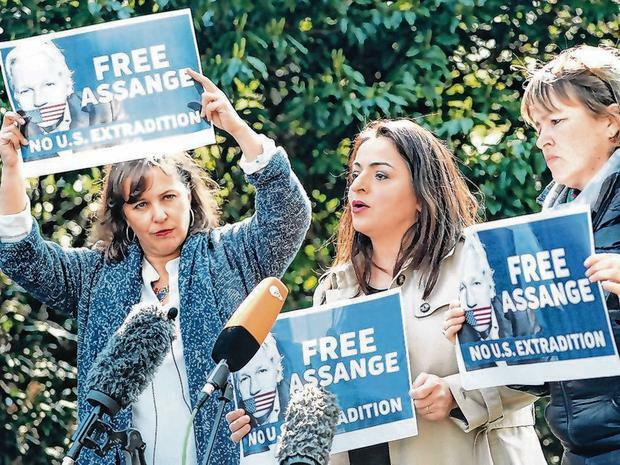 Supporters of Mr Assange said Ecuador had betrayed him at the behest of Washington, that the ending of his asylum was illegal and that it marked a dark moment for press freedom. Mr Assange is being held in a British jail and his next court appearance will be on May 2 via video link. Jemma Crew Climate change protesters at four key sites in London remain out in force over the Easter weekend as the number of arrests tipped 700. Harriet Line BRITISH MP Diane Abbott has apologised "sincerely" for drinking a mojito on public transport in London. Beverley Rouse A woman who lost her baby son and husband within days of each other is running the London Marathon to show others that they too can survive "if they don't give up". What's on this Easter bank holiday weekend? VIDEO: Police drag climate change protesters along the ground in London.